Our first stop in India was a walking tour in Mumbai. This gave us a view of a very large and crowded city. The ship then travelled to several coastal ports. 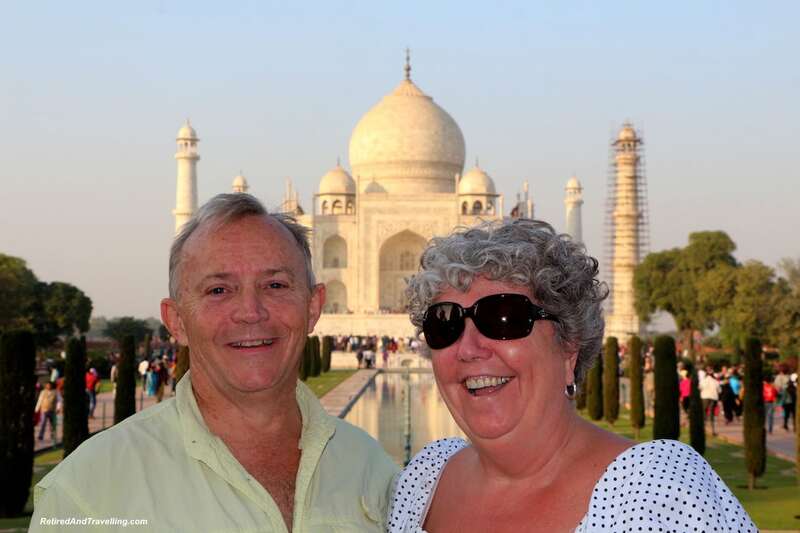 We chose to leave the ship for 3 days to travel inland to Agra. 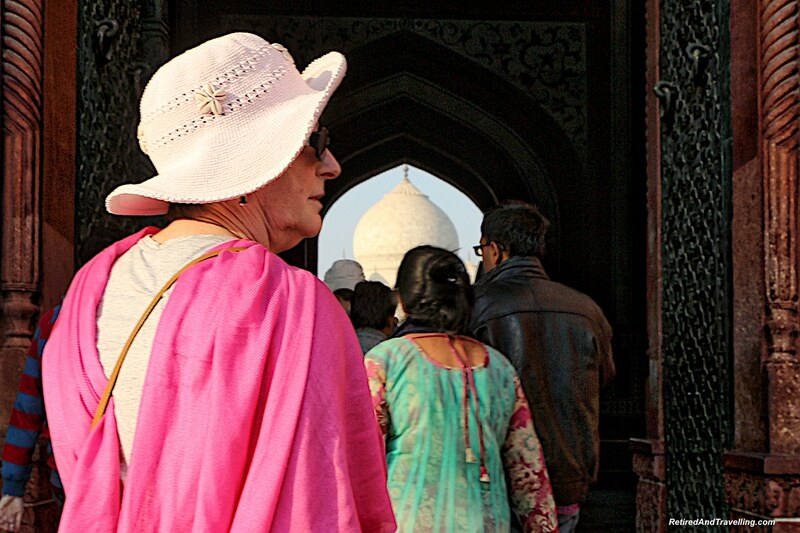 There was lots to see and do in Agra. It meant we did not miss a chance to the Taj Mahal at sunrise and sunset! It was a very long first travel day. Our wake up call was for 4 am. 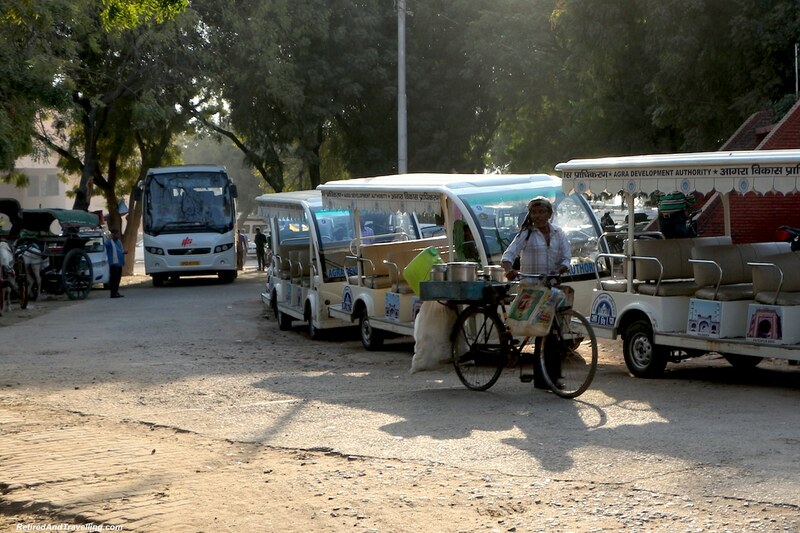 We left the cruise port, flew to Delhi and then did a long bus trip before finalizing arriving in Agra. 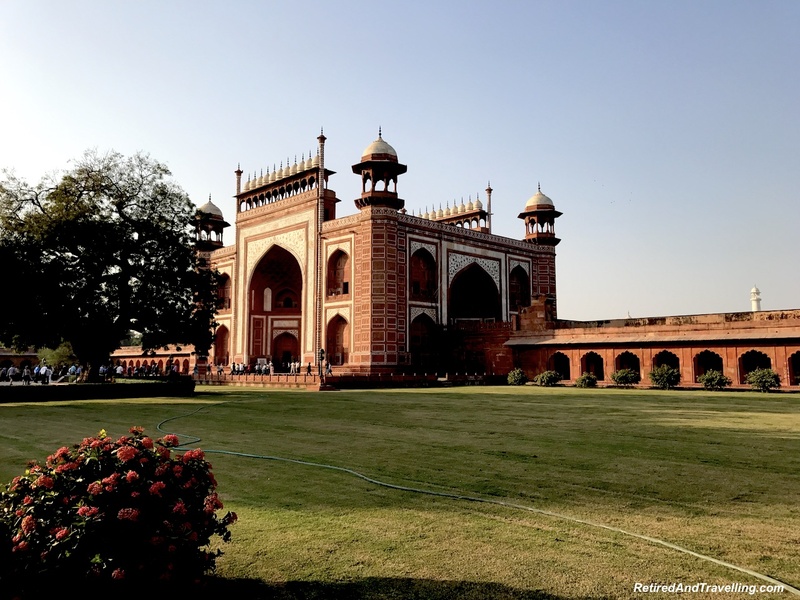 As we neared the Taj Mahal site, our guide provided us with background on this iconic site. 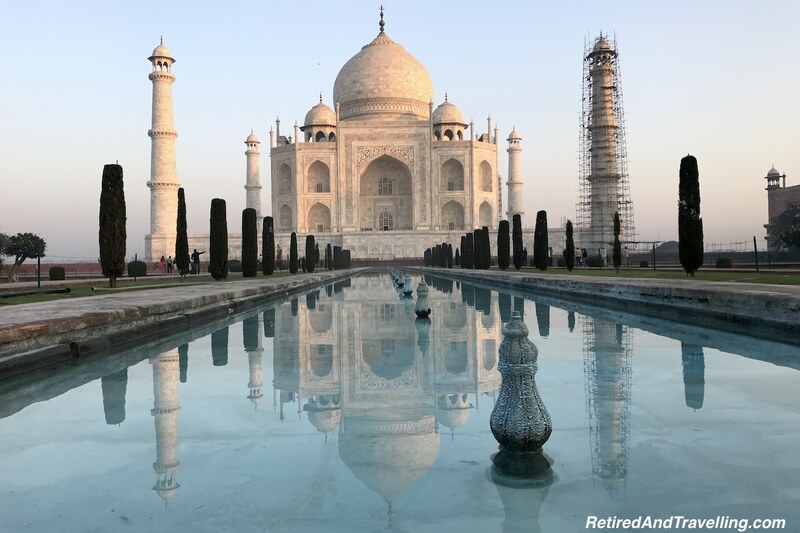 The Taj Mahal was built by the Mughal emperor, Shah Jahan to house the tomb of his wife Mumtaz Mahal. It was commissioned in 1632 and work continued on the site for over 20 years. Over 20,000 artisans worked on the complex. 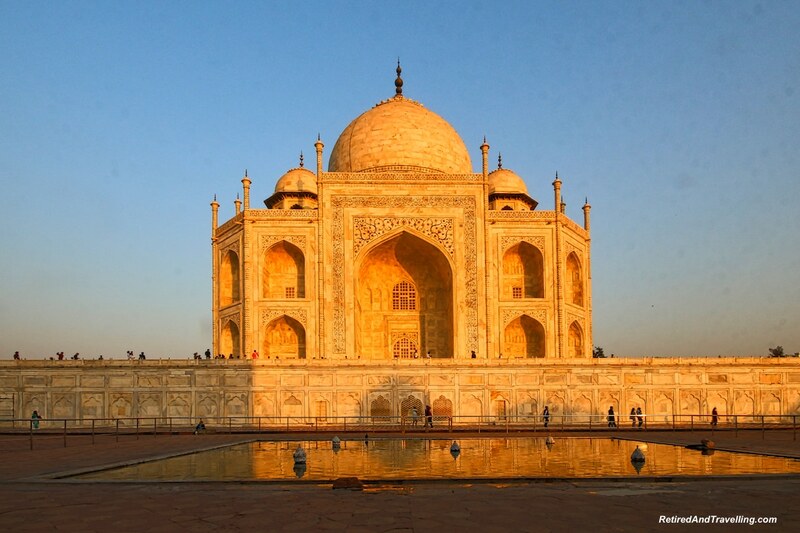 At a cost of over $800 Million USD, it is the most expensive mausoleum every built. 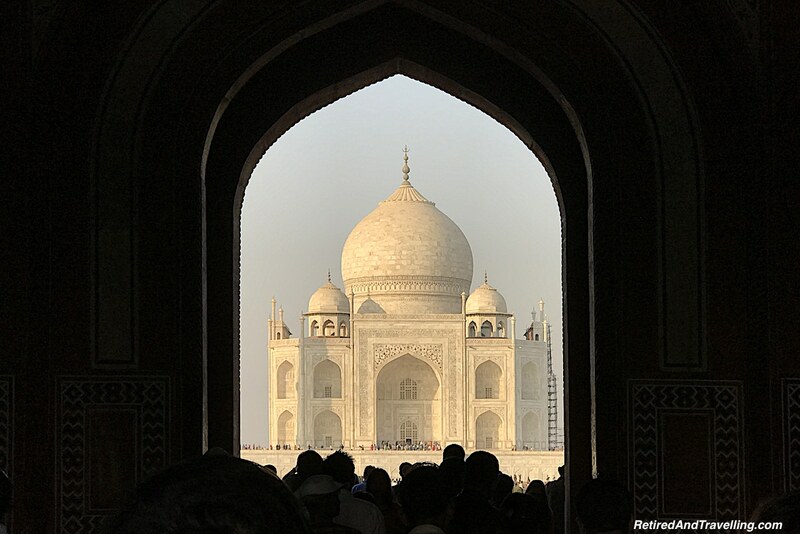 We could not wait to see the Taj Mahal at sunrise and sunset to see if it was worth it! The bus parked at an outer parking lot. 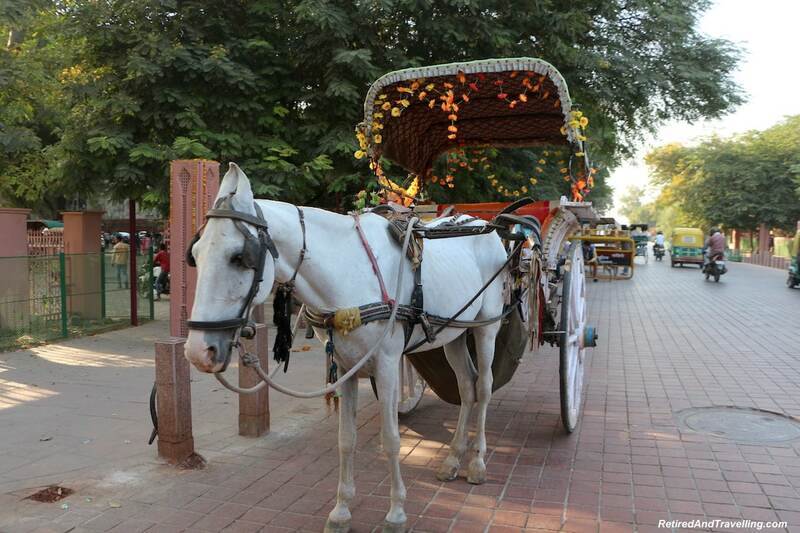 You could make the long trek to the entrance by foot, tuk tuk, horse drawn carriage or rickshaw. We got rides in large golf carts. The tour guide distributed tickets and paper booties to cover our feet if we went inside the Taj Mahal. We were separated into lines for the men and women. Each line got an extensive a pat down before we were admitted. We had been warned to take nothing with us. When they said nothing, they meant it. Our friend had her grandson’s Gingerbread Man cutout and a flashlight removed. Then they gave her a secondary pat down. The Gingerbread Man would not be seeing the Taj Mahal. And the flashlight would not help to reflect the precious stones embedded in the building. Luckily both items were retrieved when she exited. And before the precocious monkeys got to them! 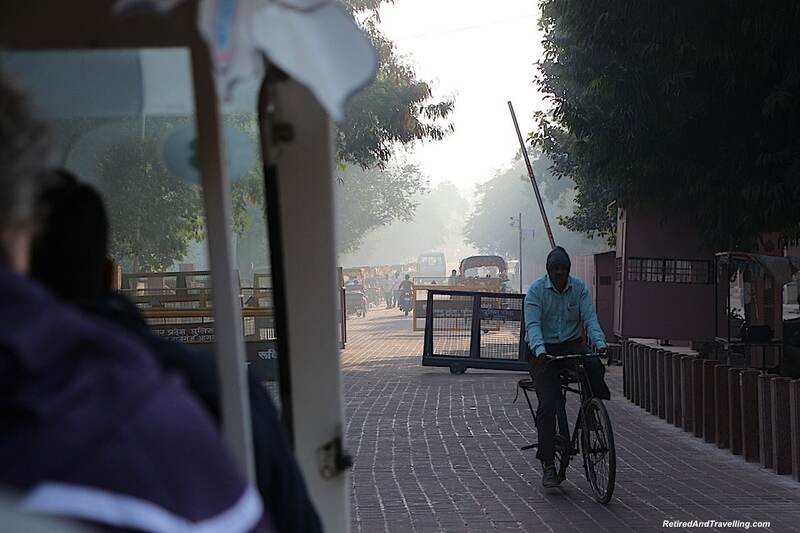 It was a long walk from the front gate to the entrance to the Taj Mahal. The group set off with determination to get our first glimpses. We were here to see the Taj Mahal at sunrise and sunset! We reached the main gate and admired our first view of the artistry we would find. 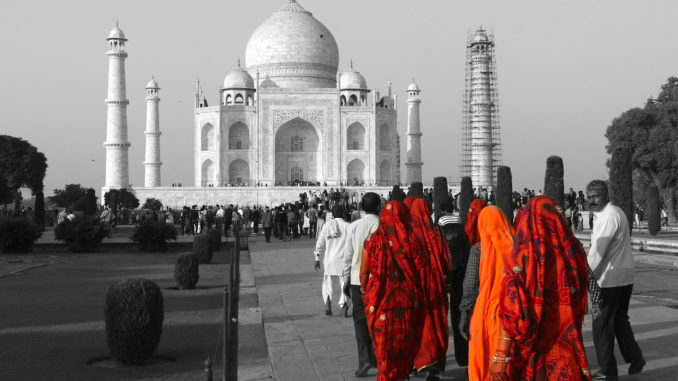 Despite seeing many pictures of the iconic Taj Mahal, it was hard to know what to expect. We got our first glimpse of the ivory-white marble mausoleum through the archway before we emerged. We had been warned before leaving the ship that there was work being done on the towers. So it was not a surprise when one tower was shrouded in scaffolding. As we walked closer, we stopped multiple times to catch the Taj Mahal from different perspectives. It looked very white and translucent from the distance. As you moved closer it became more neutral in colour. As the sun set, it took on a warm rose hue. We stopped at the key photo points trying to get a clear shot. But we were not the only ones stopping! We bent low to get the perfect reflections. 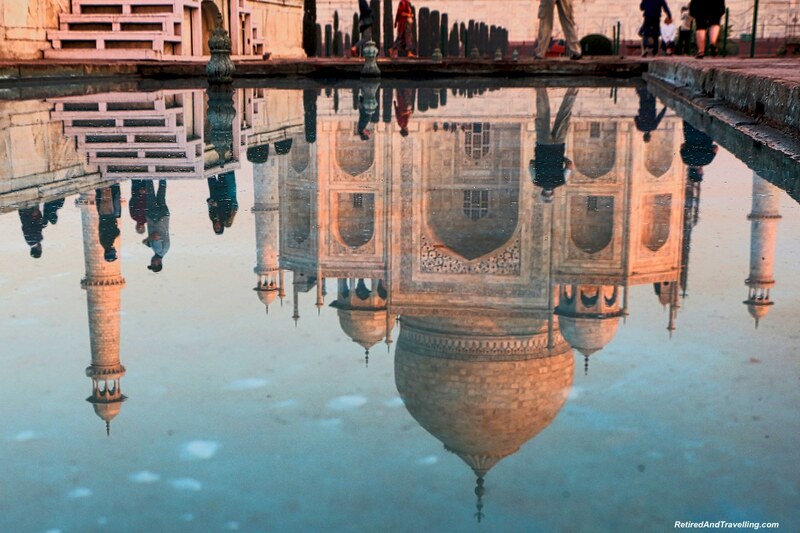 Even in the reflections we could see the sun changing the colours of the Taj Mahal. 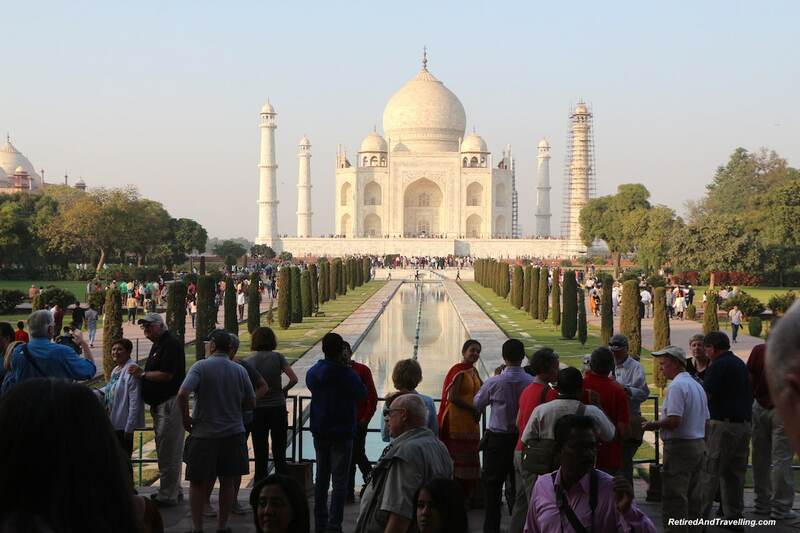 We walked around outside to see the Taj Mahal from different angles. It was interesting to watch the colour of the building change as the sun went lower. We put our booties on and then went inside. There really is not a lot to see inside this mausoleum. People crowded around the tomb. There was little light and no phones allowed. When the guards were not looking, people took out flashlights that had not been confiscated. They shined the light on some of the few gems still in the inlays. 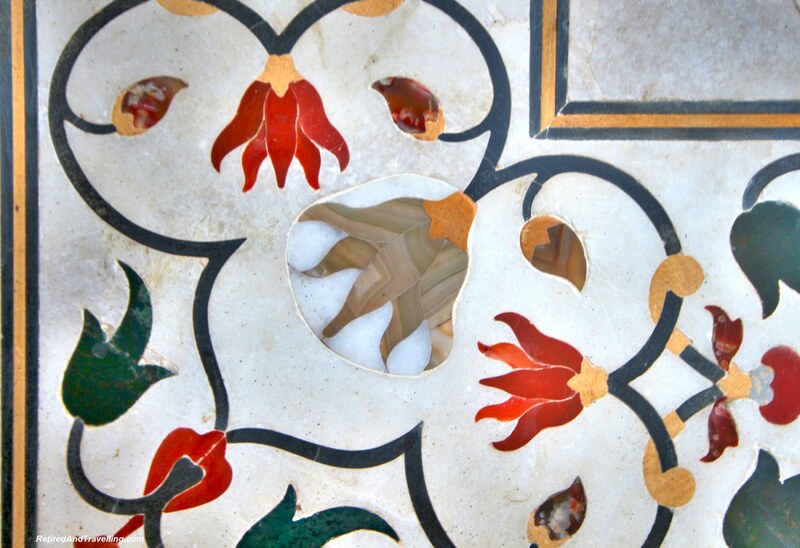 Most of the jewels in the outside inlays have long since been stolen. It was a long wait as the group finally all congregated at the meeting point. 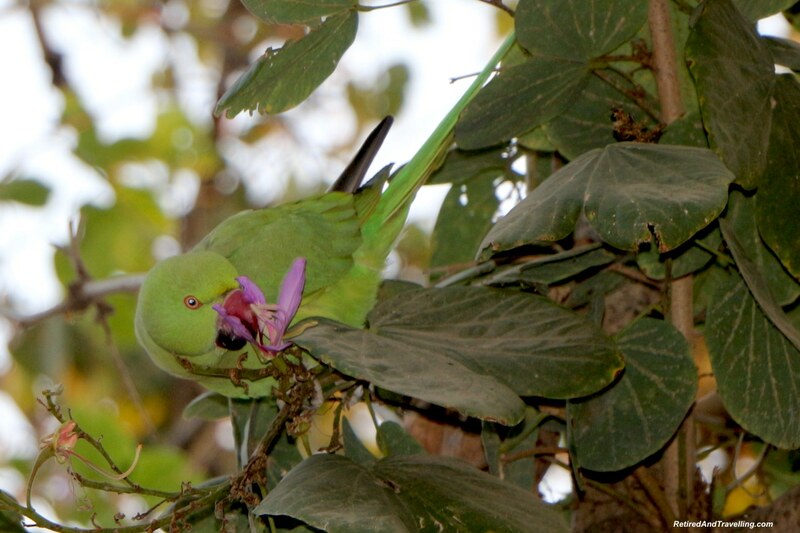 There was some distraction provided by parrots in the trees. People kept trying to get just the perfect shot! We found most of the group up early enough to grab coffee and a snack before we headed out. Everyone was excited to finish our view of the Taj Mahal at sunrise and sunset. The buses again dropped us at the parking lot. We got on the kamikaze golf carts for a high speed ride to the gate. We were surprised by the line ups when we arrived. By the time the gates opened and we made it inside, the sun had already come above the horizon. As we got closer, we realized that the sun rises off in the hills and not behind the Taj. 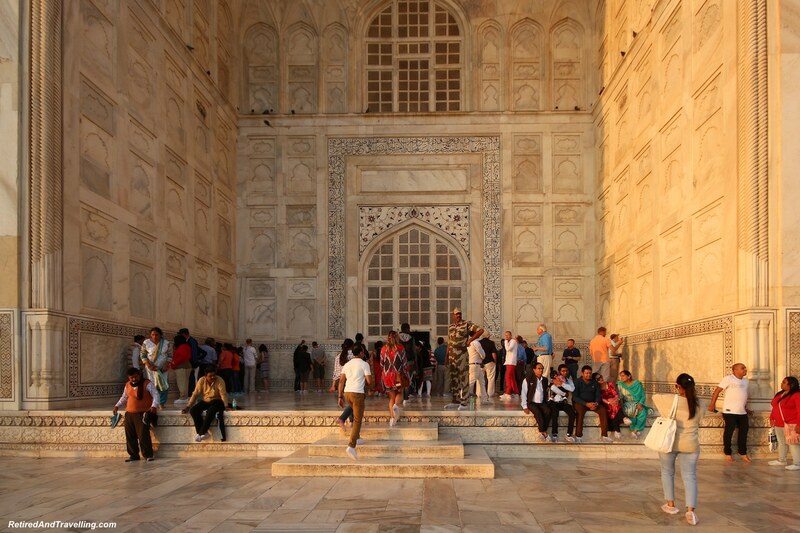 This gave us some time to walk around until the sun was high enough to be seen and to start to light the Taj. 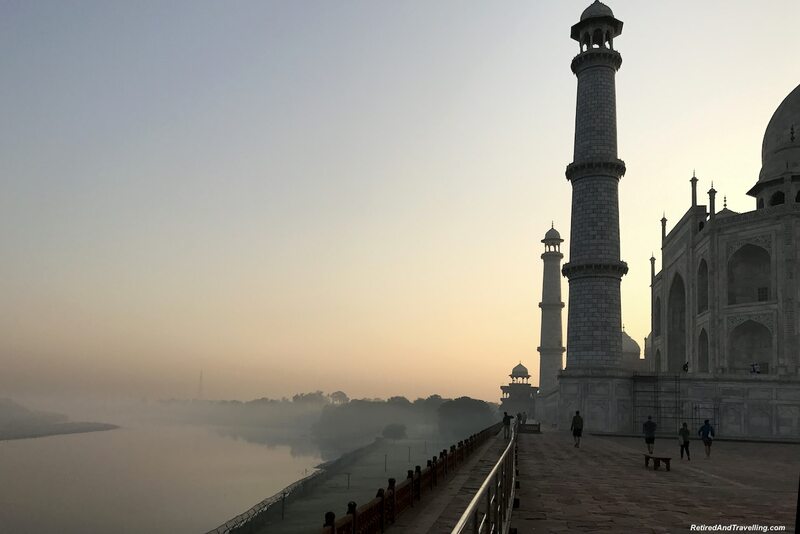 We retraced our steps to all the vantage points to catch the sun coming up and the Taj change colour. 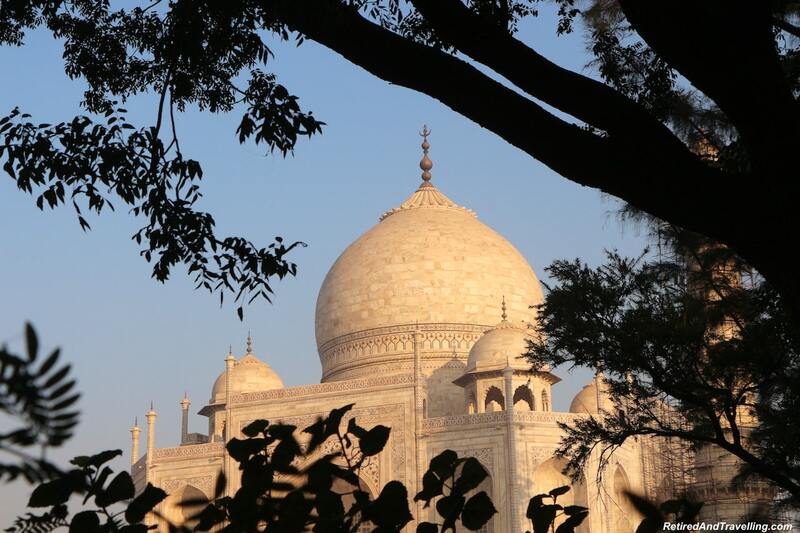 We would never forget this opportunity to see the Taj Mahal at sunrise and sunset! 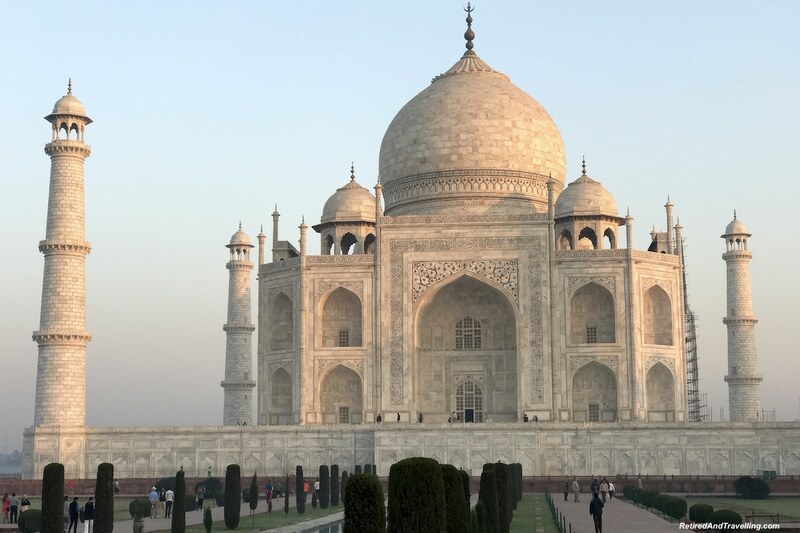 We visited this site to see the Taj Mahal at sunrise and sunset. While the Taj Mahal was the main building to visit, there were two other near identical buildings that flanked the Taj Mahal. 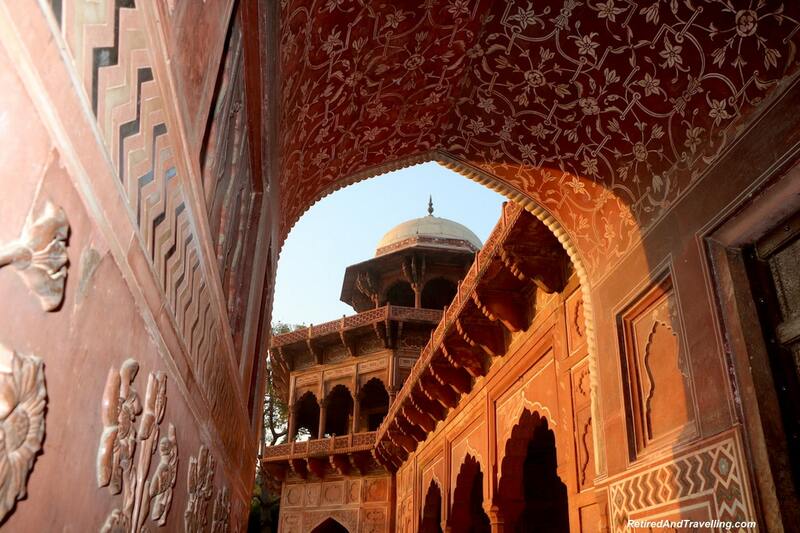 On the western side was the red sandstone mosque. A mirror image of this building on the other side was a guest house. 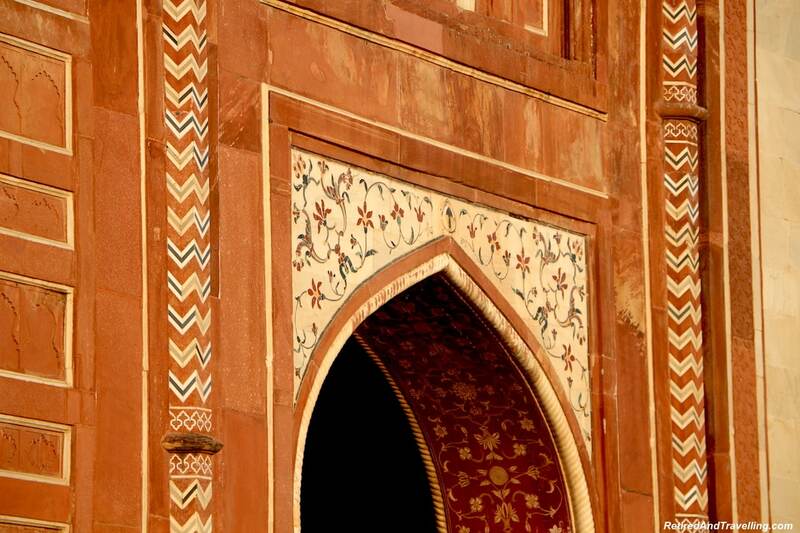 These two additional buildings provided a symmetrical balance to the Taj Mahal. The mosque faces the holy city of Mecca. It was the place of worship for the mausoleum. 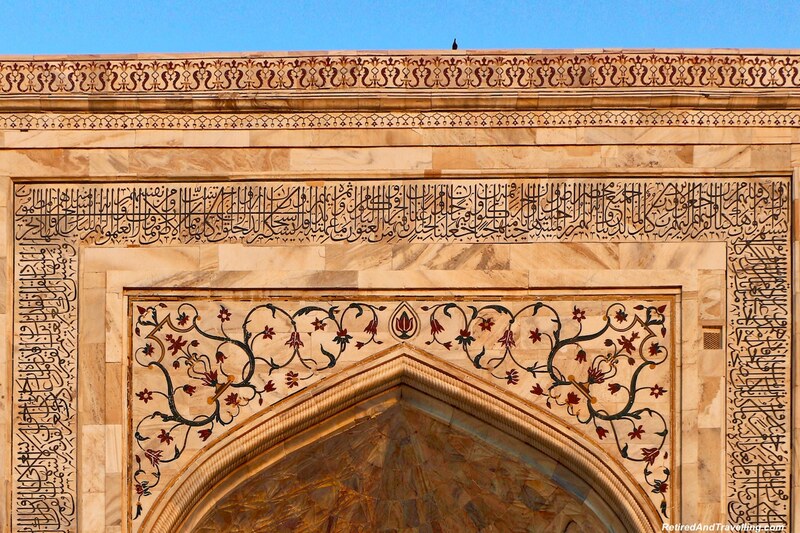 When we wandered around the mosque, we could see the artistry in this building. 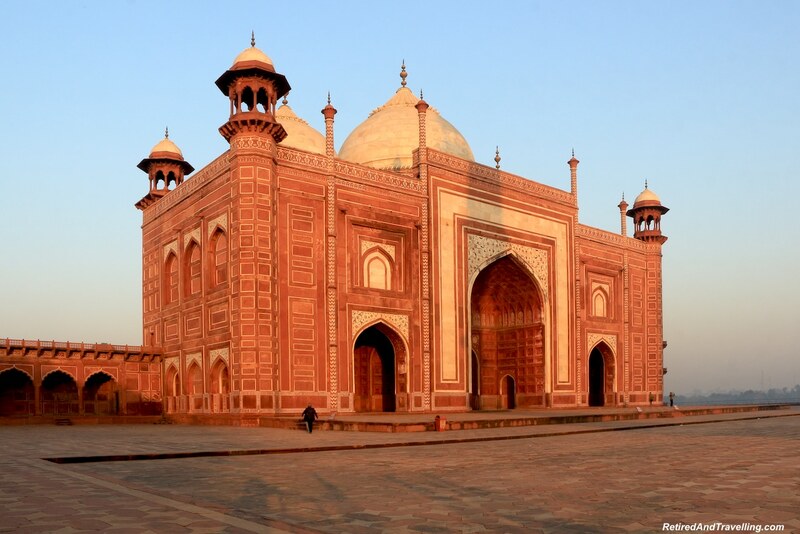 The red sandstone of the mosque was a dull colour as the sun set. 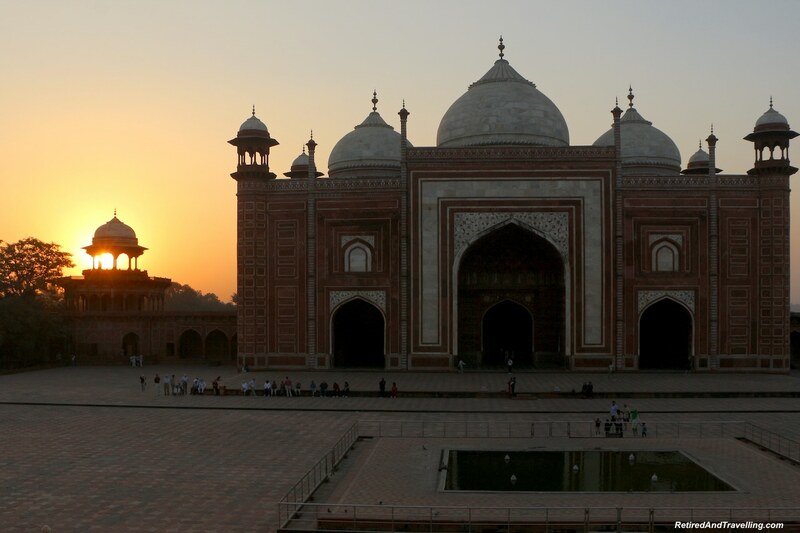 But when we returned to visit the Taj Mahal at sunrise, the mosque warmed with the sun. When we returned in the morning, we were lucky that the sky was relatively clear. Our guide had warmed us that it is sometimes foggy in the morning. We had just a light haze over the river and the perpetual smell of burning and sewage in the air. 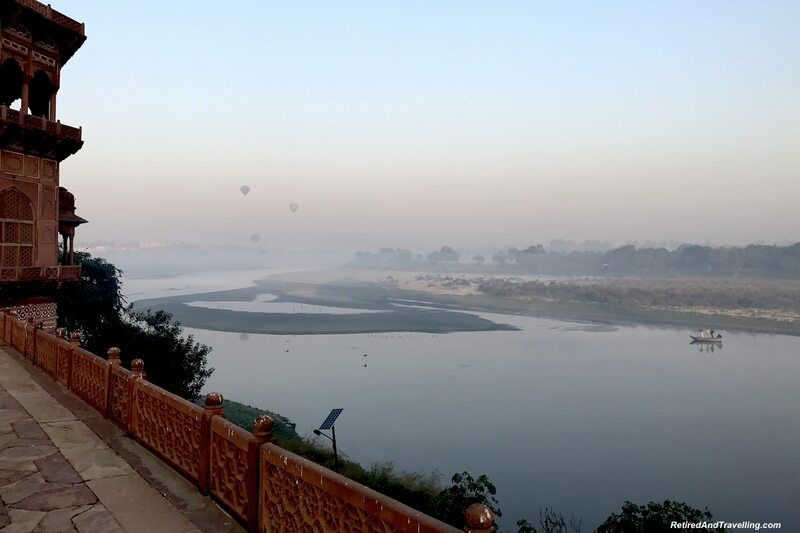 We caught sight of hot air balloons being launched on the riverbank and hovering over the mosque. 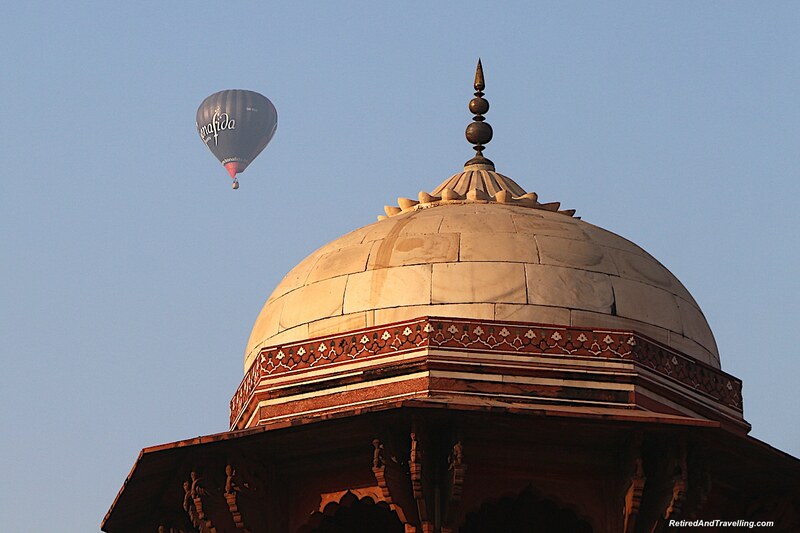 They must have provided an awesome perspective of the Taj Mahal at sunrise and sunset. When we left, we were swarmed again by hawkers selling mostly tacky tourist junk. 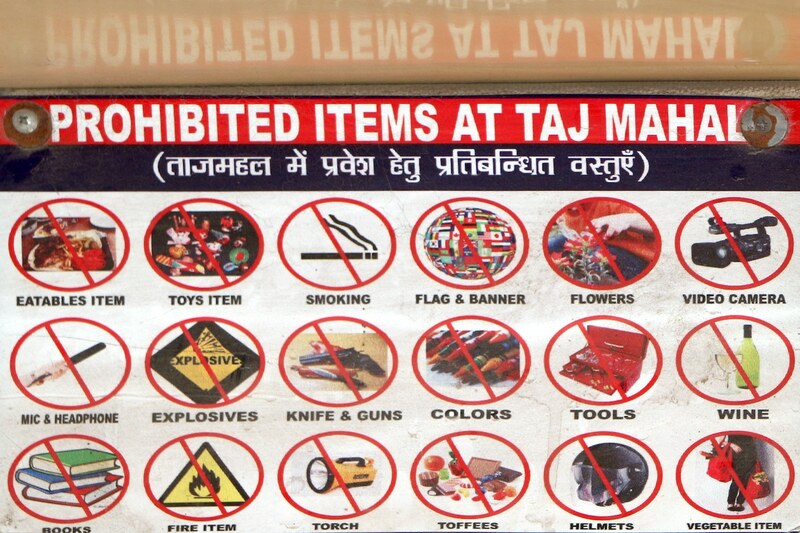 Some people bought post cards, books and all manner of things that had the Taj Mahal on them. One woman thought she was getting a bargain when she paid $2 for a Taj snow globe keychain. We all got a souvenir when she realized she got a bag of them for $2. 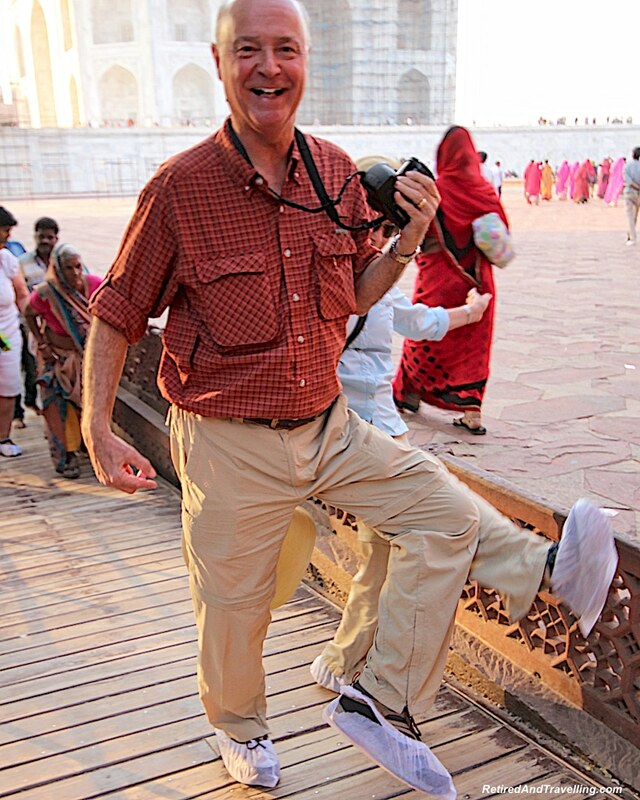 It had been a great visit to see the Taj Mahal at sunrise and sunset. Two very early mornings had paid off! The subtle changes in the lighting gave us different views that changed before our eyes. It was a sight that we would all remember. Our delights for the day were not finished. 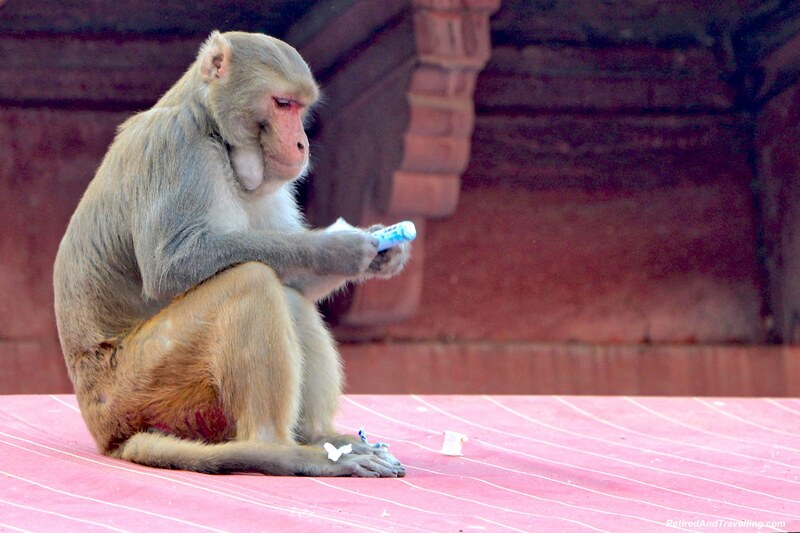 We had other things to do in Agra! People had a few options for the rest of their day. 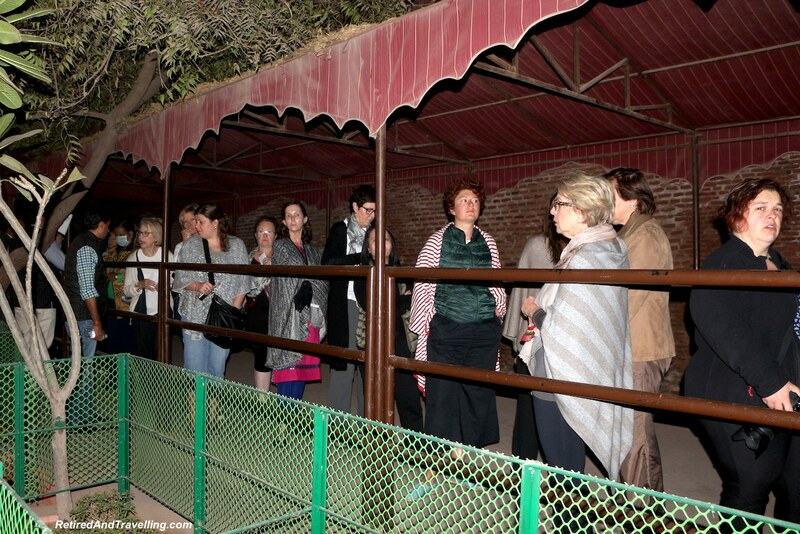 Many opted to go shopping but we were headed to see the Agra Fort, better known as the “Red Fort” for its colour. 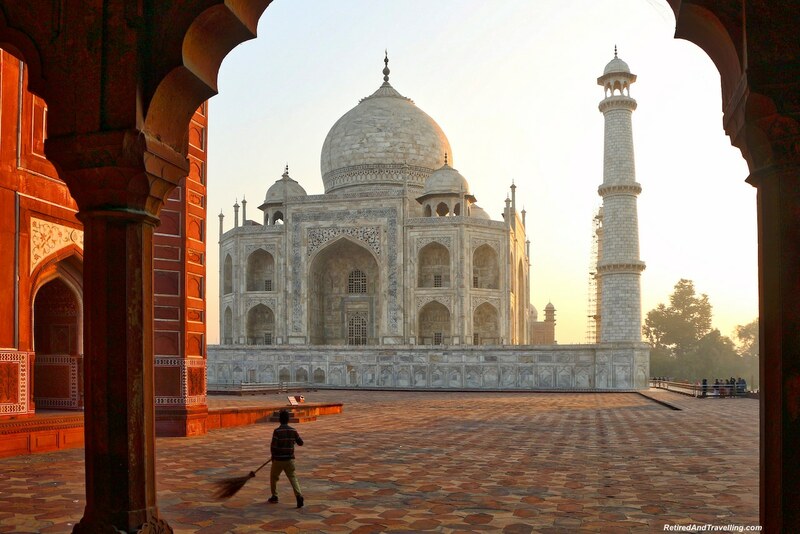 Have you seen the Taj Mahal at sunrise and sunset? Which view was your favourite? What other part of this massive site did you enjoy visiting? We are always amazed by views of the Taj Mahal, but it’s good to see the other buildings, as well as different views of the Taj. As grand as the buildings are, the smallest details are equally amazing! The artistry just astounds us. Great pictures – thanks for sharing! Hi, I am a photographer and I quite enjoyed reading your article, as well as the photos you posted. Would you be so kind to tell me what the best photography vantage points are doing sunrise? Beautiful images – especially the one of the man sweeping. Stunning. Is this area to the left of the main entrance? I’m guessing you were shooting straight into the sunrise?